As the hardreading staff has previously noted, Mrs. John Henry (a.k.a. 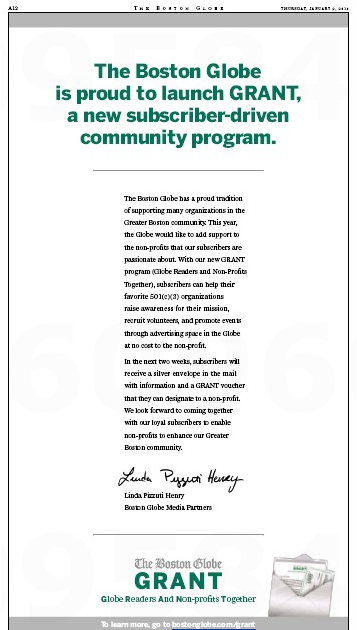 Linda Pizutti) is heading up the John-Henry-owned Boston Globe’s GRANT program, which purports to provide financial assistance to local community programs through Globe-subscriber contributions. 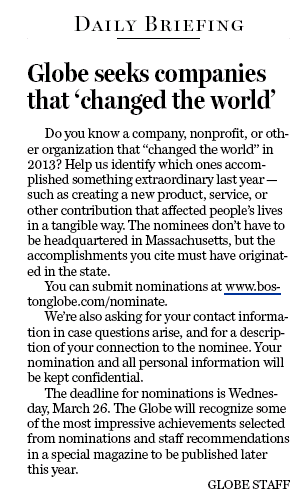 That’s all well and good, but Saturday’s Globe seemed to cross the line with this item in its Business section. Really, Globeniks: You wanna start using your newshole as a marketing tool? Isn’t that supposed to be the exclusive province of the Boston Herald? This entry was posted on Sunday, March 2nd, 2014 at 11:25 am and is filed under Uncategorized. You can follow any responses to this entry through the RSS 2.0 feed. You can leave a response, or trackback from your own site.